Diesel engines have certainly changed over the last couple of decades. They previously used a fuel injection system for delivering fuel to the engine. This was done through a series of pump nozzles that would pump the fuel at low pressure into the fuel injectors. The downside to this diesel system is that it generates more carbon emissions. As society has become more environmentally friendly, this led to the creation of the common rail diesel engine. If you see a diesel-powered vehicle on the road today, chances are that it has a common rail diesel engine in it. These types of diesel engines produce fewer carbon emissions, thanks to its common rail technology. 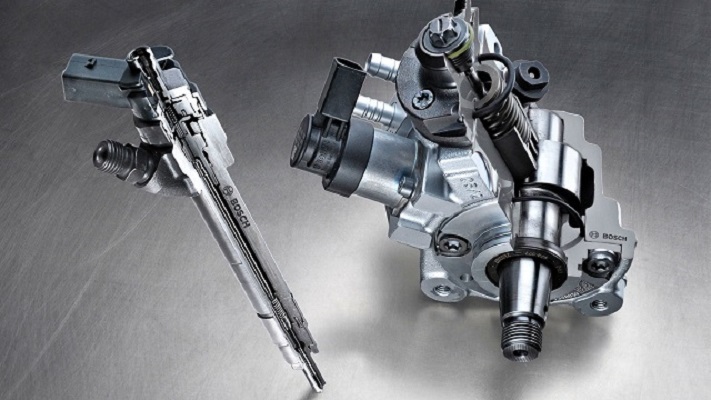 This is a special type of fuel injection system which consists of a high-pressure rail and multiple solenoid valves. Each valve receives fuel from the rail, where it then goes into the combustion chamber. It might sound like the common rail diesel engine is better because of its environmental friendliness. But it might not necessarily be the best diesel engine for you. Let’s example the pros and cons of this engine to see what it is really all about. As previously stated, the common rail diesel engine produces fewer emissions. In fact, this was the primary reason that the engine was created in the first place. After the government began passing more regulations for vehicle manufacturers to reduce carbon emissions, they came up with the common rail diesel engine system as a way of doing that. This is precisely why you don’t see too much black smoke shooting out of the truck’s exhaust pipe anymore. Another good thing about the common rail diesel engine is that it is more powerful. Compared to a regular fuel injection diesel engine, the common rail has a power increase of 25%. You will appreciate this superior engine performance as you are driving the vehicle on the road. Meanwhile, the overall driving experience will be better too. You won’t hear so many noises coming from the engine like you would with the fuel injection diesel engine. Plus, the vibrations won’t even be as intense either. But what you will probably care about the most is the fuel mileage. Well, you will be happy to know that the common rail diesel engine has better gas mileage than the fuel injection diesel engine. That means you’ll be able to drive more miles and make fewer stops at the gas station. A common rail diesel engine does not have as many cons as it does pros. But you should be made aware of the cons just in case they are more important to you. Perhaps the biggest con of a common rail diesel engine is the cost. Since this is a more sophisticated type of diesel engine, it costs a lot more money than a fuel injection engine. The price of the engine will be reflected in the price of the vehicle that you purchase which has this engine in it. And if the engine were to ever malfunction or have any defective components, it will also cost more money to get those components replaced. You might think that maintaining your vehicle will prevent you from having defective components in the engine. Well, you will need to maintain your engine regularly because the common rail diesel engine requires a lot more maintenance than the fuel injection engine. This maintenance will also be costlier and require more of your time. The ideal situation will be to work for a commercial company which owns your vehicle. That way, they can worry about the repairs and maintenance of the vehicle so that you don’t have to. But if you are purchasing the vehicle for yourself or your own business, be prepared for a lot of extra expenses with this common rail diesel engine in it.